EDITOR’S NOTE: This photo essay accompanies Seth Freed Wessler’s article “Black Deaths Matter: A Generation of African Americans Are Buried in Racism,” published in the November 2, 2015, edition of The Nation. 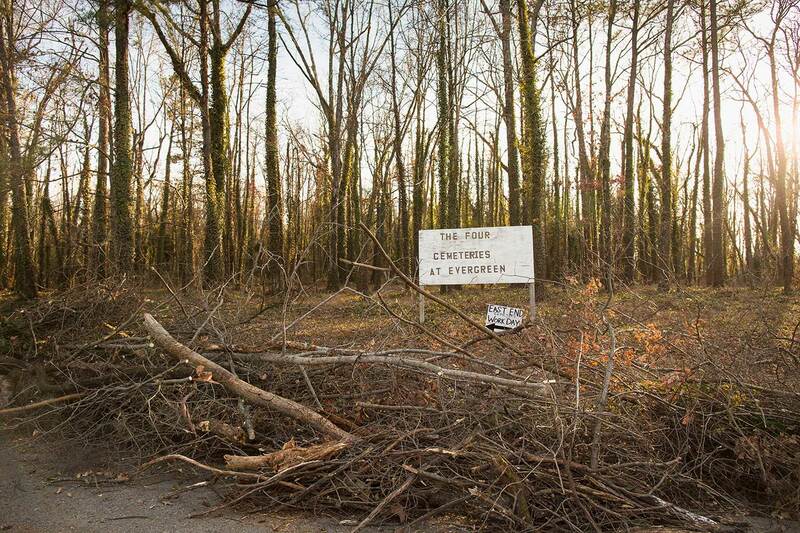 We made our first trip to East End Cemetery, an abandoned and overgrown African-American burial ground at the edge of Richmond, in December 2014. At the time, we were seeking footage for our documentary, Make the Ground Talk, about a vanished black community called Magruder, near Williamsburg, which was uprooted by the US government. That land is now a top-secret military base; access is severely limited, and videography is not permitted. Almost immediately, however, East End became a central part of the broader story we aim to tell. We watched volunteers—Boy Scouts on our first day—peel back English ivy, vines, and roots. Erin joined them. 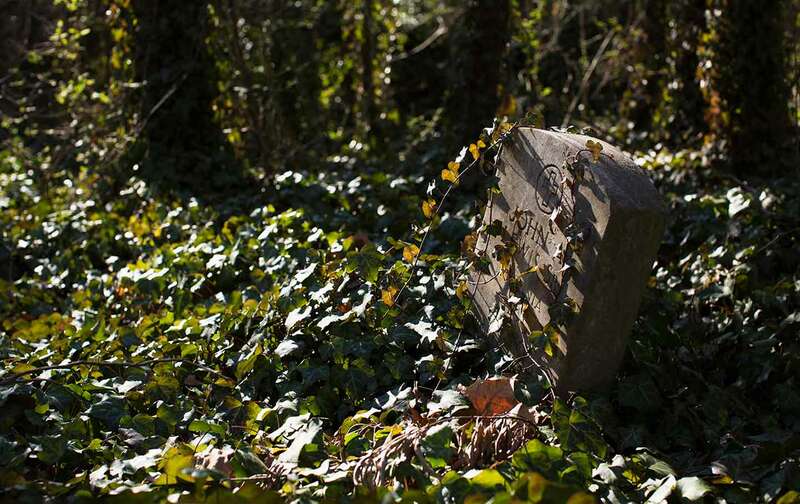 To unearth a headstone that has been choked by brush is tremendously powerful. It is to connect in a small way to the person it memorializes—and to black Richmond at its height. East End became its own two-pronged initiative for us: to help restore the place physically and to reclaim its history, in images and words. East End was originally incorporated as Greenwood Cemetery in 1891 by a group of prominent African-American citizens. They sold the property back to its original owners after defaulting on bank payments. A new burial association took over in 1897 and the cemetery took its current name. Other back-and-forths in ownership followed. The cemetery grew to approximately 16 acres, with an estimated 13,000 interments. No arrangements for perpetual care were made at East End, so when the community that supported the cemetery began to disperse under the weight of many forces—among these, the attack on African-American political power and wealth in the early 20th century and the demise of de jure segregation, which opened burial grounds in the city to blacks—East End deteriorated. By 2013, after decades of neglect, it had been swallowed by the surrounding forest. Some unscrupulous citizens had also turned it into an illegal trash dump. As a business entity, the cemetery is again in default, according to the county and the last living member of the burial association. 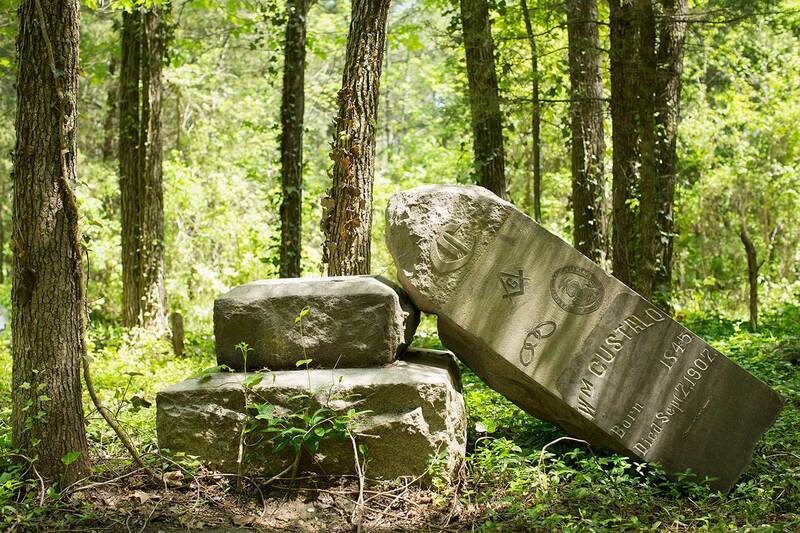 A volunteer group does what it can to beat back nature and to record information from the headstones it unearths, but there is no government support for this work. 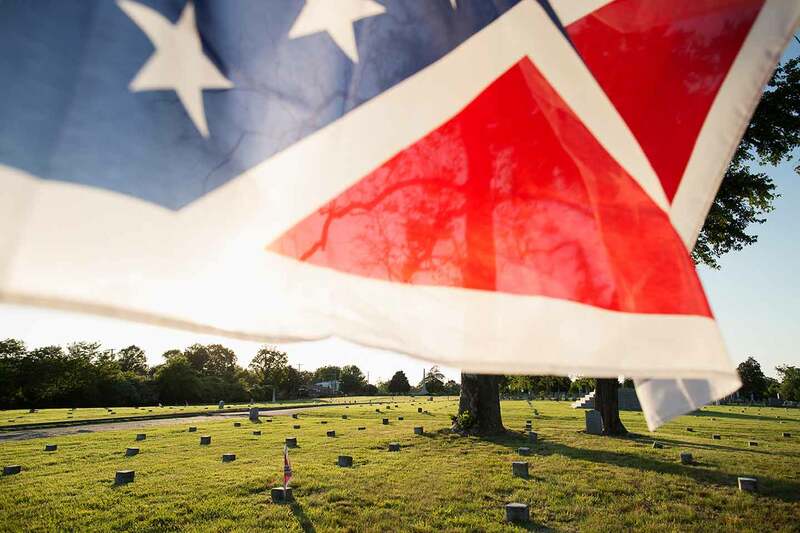 Public funds are earmarked for certain groups to care for Confederate graves, including more than 2,000 at neighboring Oakwood Cemetery, under section 10.1-2211 of the Virginia state code. 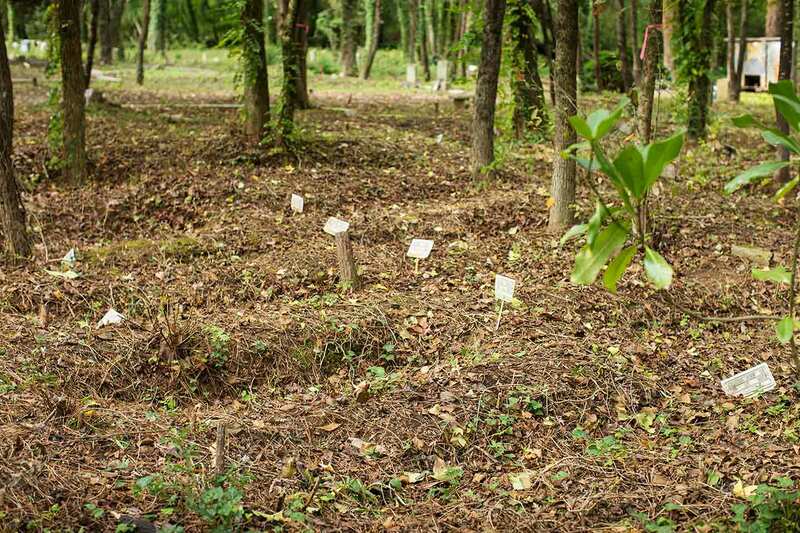 Perhaps a similar arrangement could be made to honor the formerly enslaved and their descendants, thousands of whom are buried at East End. 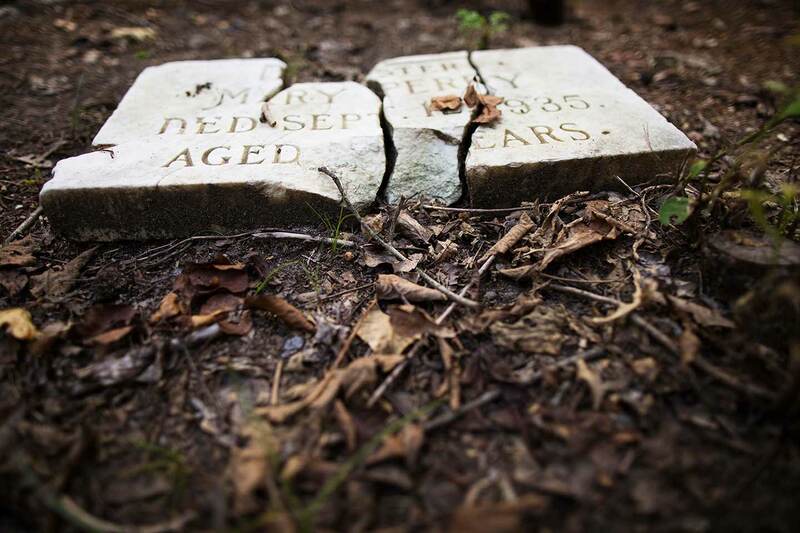 The photos below show both the deterioration and the revival of the historic burial ground. We first passed East End without knowing it. Through dense greenery, Erin spotted the white corners of a few large monuments as we drove by. We assumed these were outliers from Evergreen, the larger, better known, and equally overgrown black cemetery next door. John A. Lewis Sr. is one of many veterans buried at East End. 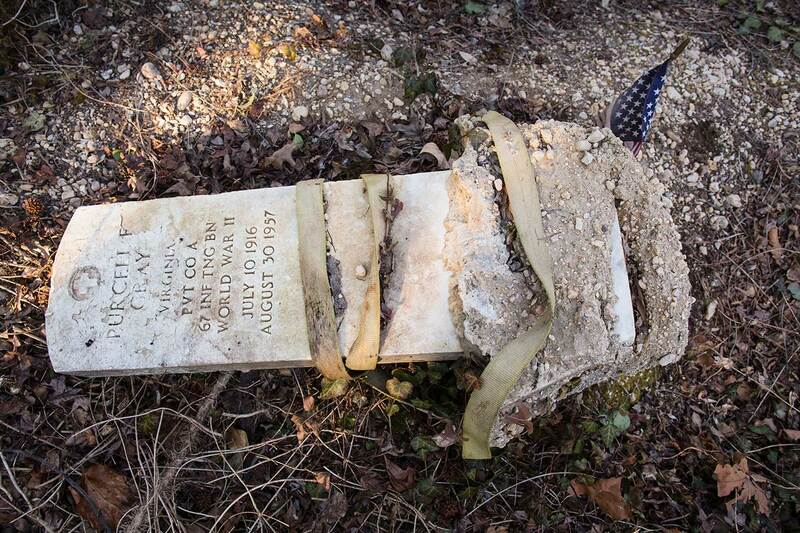 His stone was uncovered in recent months, but it lies in a section of the 16-acre cemetery that volunteers have not been able to clear completely. English ivy and other invasive plants may swallow the stone again. 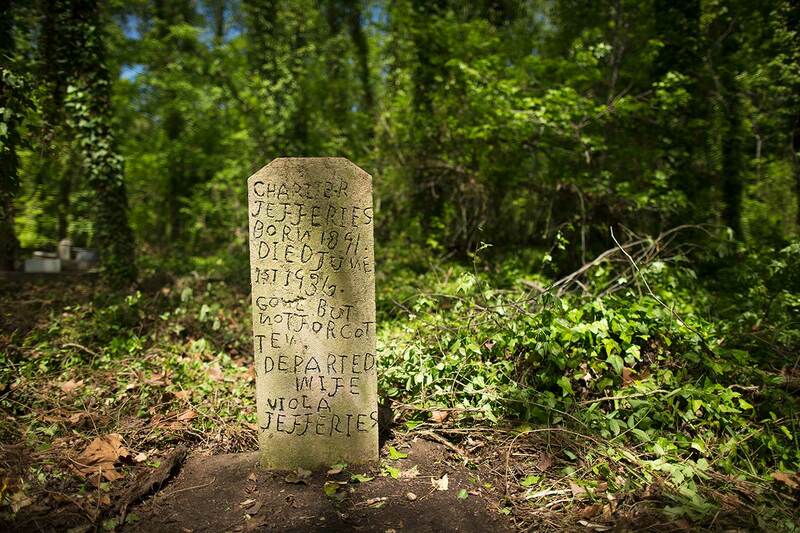 The handmade headstone of Charles Jefferies—his name appears in many documents as “Jeffries”—reminds me of my great-grandfather’s roughhewn headstone at another Virginia cemetery, one that sits within the compound of a restricted military base to which I have limited access. 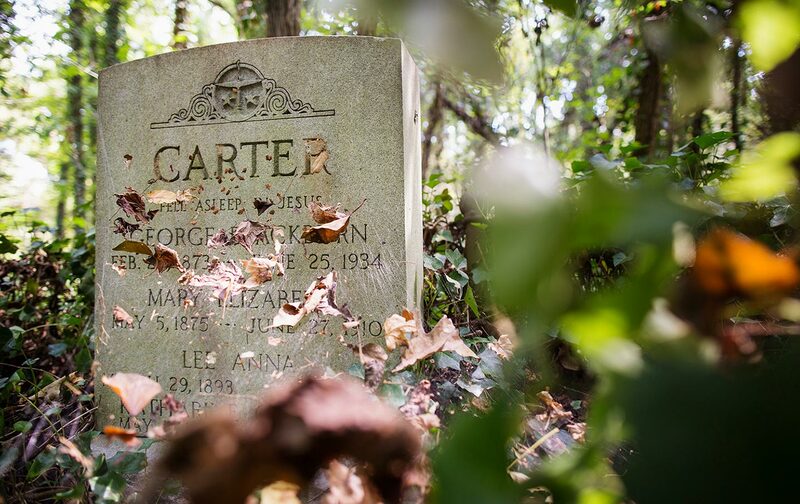 This is one of the reasons we volunteer at East End: not only are we revealing a historic black cemetery, stone by stone, we are helping to reclaim lost stories of Richmond’s African-American community. William Custalo—restaurateur, bank officer, and founding member of the cemetery’s first burial association—was one of Richmond’s most prominent African Americans in the late 19th and early 20th centuries. On the heels of Reconstruction, black Richmond was at its height—the Jackson Ward neighborhood was called “Black Wall Street” and the “Harlem of the South.” But Custalo lived long enough to see the first of many successful attacks on the rights and privileges won by African Americans in the Civil War. The majority of the grave markers at East End are flat stones, purchased by family members of the deceased as well as co-workers, fellow club members, and church congregants. 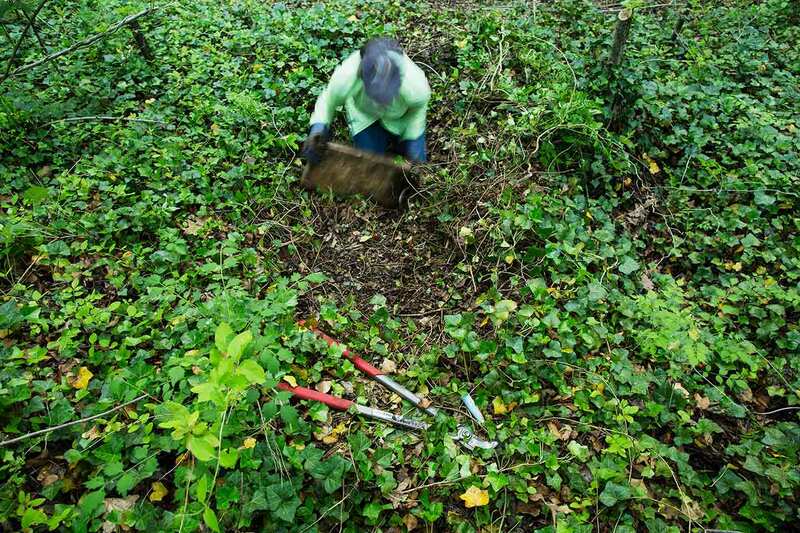 Most have been covered by a carpet of English ivy for decades, which volunteers peel back by hand and with small tools, slowly and carefully. 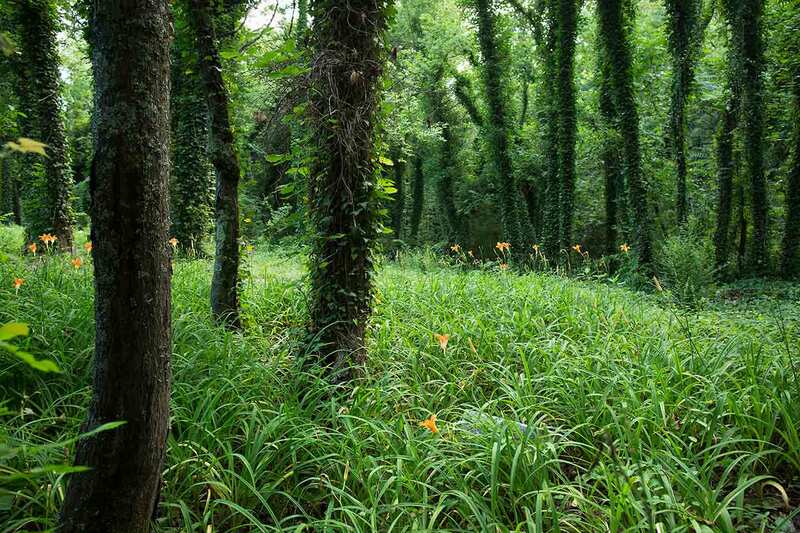 Summer growth in a cleared area, June 21, 2015. 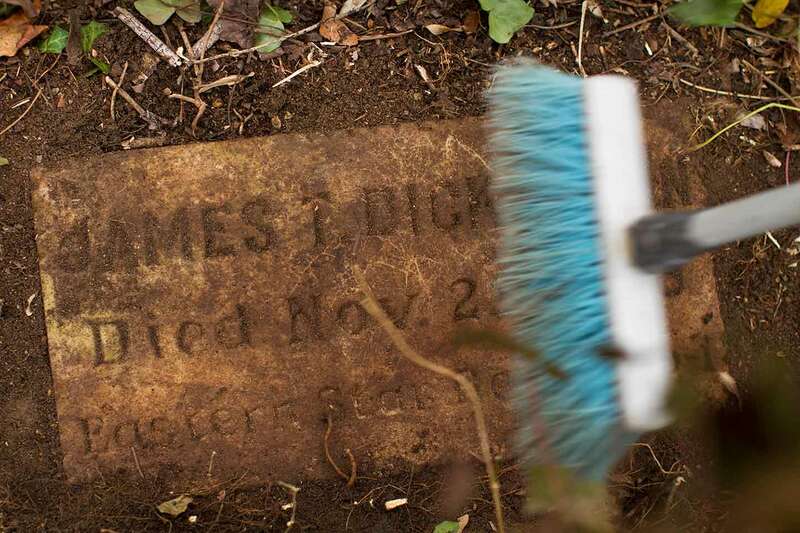 To find a headstone—James Dickinson’s was among the first we helped uncover as volunteers—is to get hooked on this process of revealing history. In many cases, headstones are buried not only beneath tangles of ivy but also beneath accumulated dirt. After unearthing a headstone, volunteers rinse it with water that volunteer coordinator John Shuck hauls out in his truck every weekend. The sun dries and bleaches the stone over time; the small team of volunteers returns to beat back creeping foliage. The Four Cemeteries sign was meant to be temporary, a place holder for something more robust that would honor East End, Evergreen (which has its own commemorative marker), the Colored Paupers Cemetery, and the “colored” section of Oakwood. One positive sign: Henrico County hauls away the tons of limbs and plant matter that volunteers pile up in front of the sign. East End declined with the fortunes and power of Richmond’s black community. Some families exhumed their kin and reburied them elsewhere. We believe this happened with Purcell Gray, whose Veterans Administration headstone may have been too heavy to move. Neglect draws disrespect. East End has served as a convenient, though illegal dumping ground. 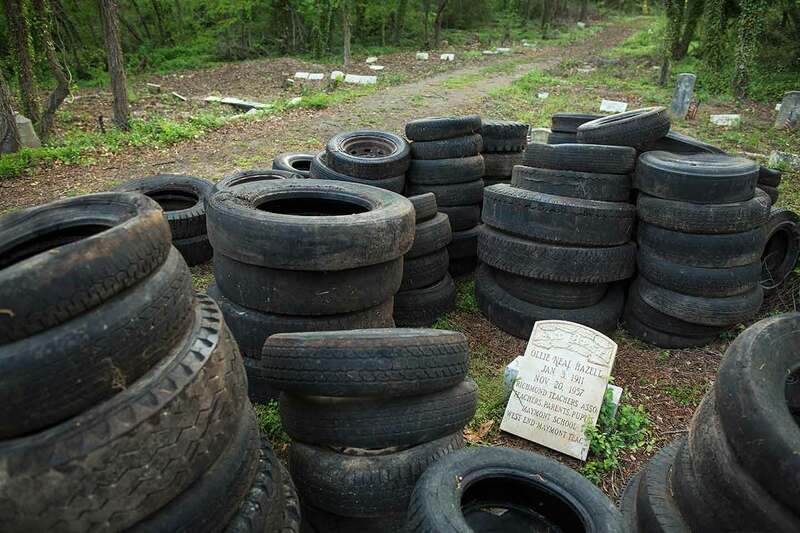 Over 1,500 used tires have been dug up and hauled away, along with caches of garbage—household trash, appliances small and large, even old building materials. Oakwood is owned by the city of Richmond. The Confederate section has about 17,000 burials. 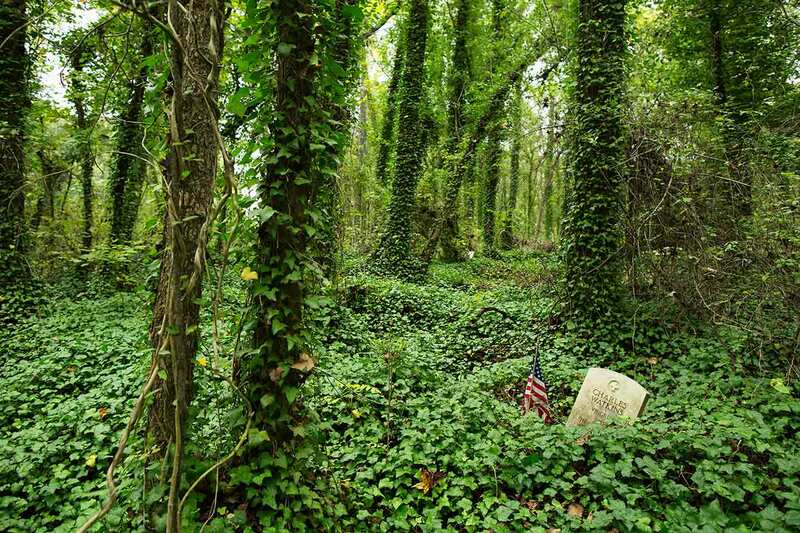 A little over 2,000 of those graves are maintained with funding from the state of Virginia, through a provision in the state code that provides money to groups such as the Daughters of the Confederacy and Sons of Confederate Veterans to maintain graves. Such support further embeds the mythology and racism of neo-Confederates in our public spaces. Many stones at East End are damaged. Some have clearly been vandalized; others, it’s hard to tell. Some stretches of East End appear corrugated. Depressions indicate graves in which there is no vault for the casket. The soil settles as it reclaims the organic material buried beneath it. Some graves have temporary markers, small metal signs with names often obliterated by the elements; some have nothing. Charles Watkins’s headstone was the first I found, in January 2015. I tripped over it, then returned to rip off the ivy. As with all the people we uncover, I did some research on Mr. Watkins. Online you can find the form his wife, Lucille, submitted to get him an official Veterans Administration headstone. He shows up on the 1920 census, too, and there’s a brief obituary in the paper marking his passing. On Memorial Day, people plant American flags next to the veterans’ headstones that are visible. Hundreds have yet to be uncovered. Brian PalmerBrian Palmer is a visual journalist and scholar-in-residence in the Division of Learning Innovation and Student Success at Virginia Commonwealth University. He lives in Richmond, Virginia, where he is at work on a documentary, Make the Ground Talk. Erin Hollaway PalmerErin Hollaway Palmer is an editor, writer, and educator. She lives in Richmond, Virginia, where she is at work on a documentary, Make the Ground Talk.